← Great Szczur’s ghost, it’s 110 degrees in Lansing? I figured a lot of people would be at Fifth Third Ballpark, home of the West Michigan Whitecaps, tonight, but there were a lot more than I expected. Tonight’s game was my first time at the stadium, which opened in 1994 as Old Kent Park (its name through the 2001 season). According to the Whitecaps’ official website, the park’s total capacity is 10,071, but a local TV sportscaster said more than 10,500 people packed into the stadium tonight. 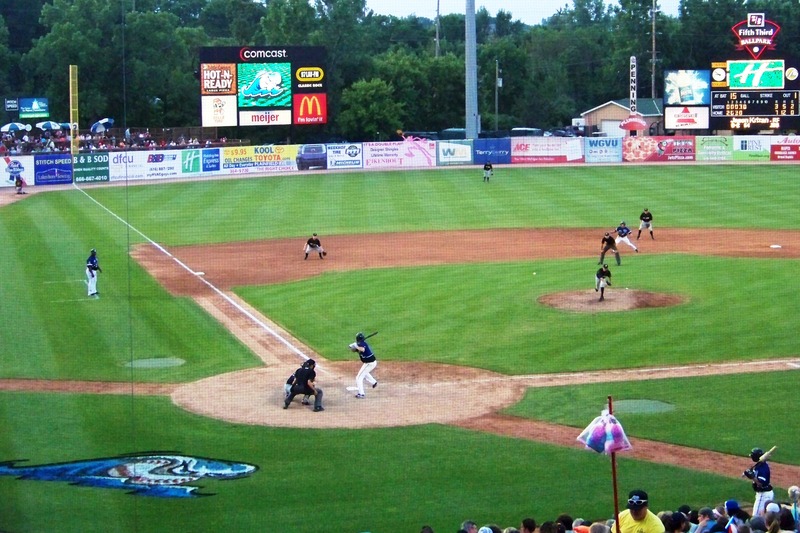 I recall only one other time I’ve been at a Midwest League game with that many people in the ballpark. 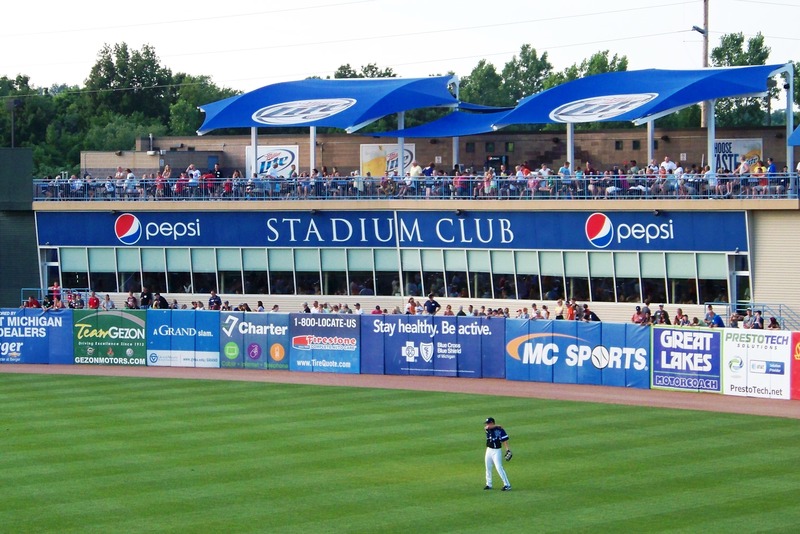 It was at Kane County’s Elfstrom Stadium when rehabbing Chicago Cubs players Aramis Ramirez and Reed Johnson were in the lineup for the Peoria Chiefs. Because there were so many people in the ballpark, it wasn’t easy to move around to different vantage points or just walk on the concourse in general. There are lots of food options (which I’ll write about in more detail after I sample some more offerings tomorrow), but the sheer number of people buying food at the same time caused backups at some concession stands and grills. The ballfield and the stadium look nice and are well-maintained. Beyond the outfield wall are a videoboard, a scoreboard and the Stadium Club. It was Star Wars Night at the park, and the Force clearly was with the home team. The Whitecaps won 11-3. The offense was led by Nick Castellanos, the Detroit Tigers’ top draft pick (44th overall) last year. He went 3-for-4 with two home runs. According to the game story on the Whitecaps website, Castellanos now leads the Midwest League with 94 hits, leads the Whitecaps with 52 RBI, and ranks among the league leaders with a .306 batting average and 23 doubles. 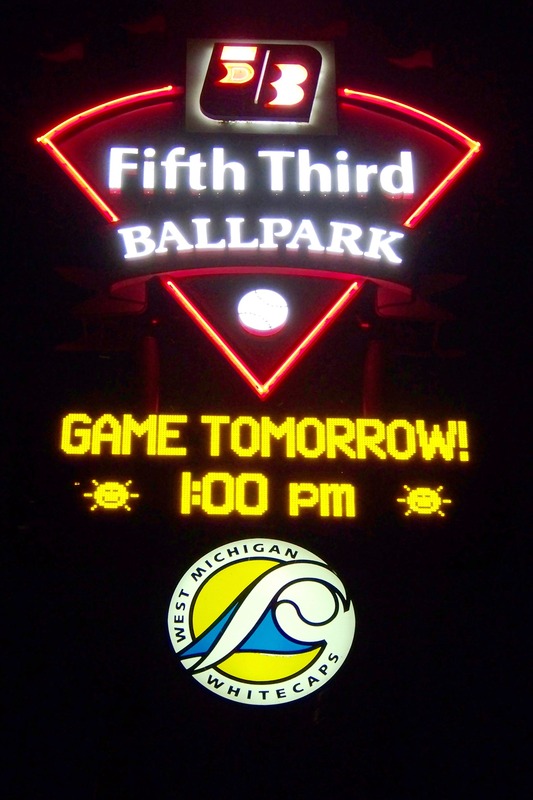 I’ll be back at Fifth Third Ballpark tomorrow for the second game of the series. The theme for tomorrow’s game is “Harry Potter Afternoon,” and the weather is expected to be hot and humid. This entry was posted in Bowling Green Hot Rods, Kane County Cougars, Midwest League, Peoria Chiefs, West Michigan Whitecaps. Bookmark the permalink.